When I arrived in Paisley, Scotland, Cassie told me my bed had arrived, but we had to build it. First we dragged the delivery boxes up the stairs. Between scratching our heads over diagrams and singing “My Favorite Things,” with a twist of a screwdriver here and a hand-pounding there, a sturdy metal frame bunk bed took shape, filling the better part of my bedroom. The bed was ingenious, as are many of Britain’s appliances, with a futon cushion for a mattress and I believe some of the magic of “raindrops on roses and whiskers on kittens.” All it took was a push for the bottom bunk to turn it into a sofa for day use, perfect for reading, writing in my journal or petting the cat. My first evening in Paisley, Frank brought home dinner – fish and chips to die for. I felt guilty eating such a delicious meal in front of Cass and Frank, since they are both gluten intolerant and ate something much less appetizing. When I went upstairs to bed, I found it made with four soft pillows and a pretty white comforter. I fell asleep to the evening trains. I couldn’t see them for the trees, but they were a familiar lullaby as I fell asleep in a foreign place. I grew up near where a train passed twice a day and it has always been a comforting sound, reminding me of the security of family love. We drove on to Stirling and Falkirk, sites of other battles and beautiful stone castles. I was reminded, people of every country and time want their freedom. We always have to fight for it. On the way home, as Cassie played small practice bagpipes in the back seat, I began whistling a tune. Frank asked me what it was. I told him I made it up. They thought it sounded like a Highland lament and Cassie played it beautifully on her bagpipes. ﻿﻿ ﻿June 5th we started early for Loch Lomond, narrow in its nestled hills, misty on the mountain tops. I never stopped marveling at all the water in and around Scotland. 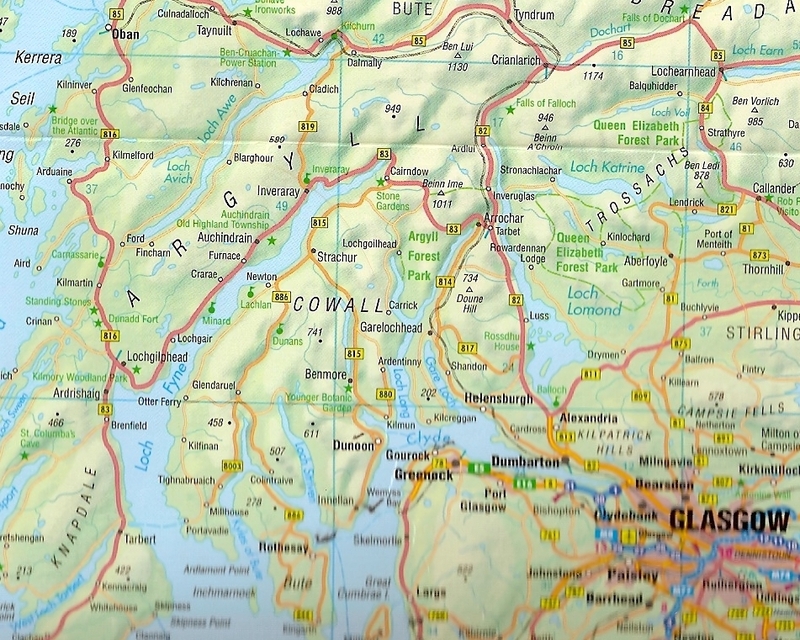 Next stop Inveraray, the kind of town one hopes to see in this life – sweet, quaint, accessed by a bridge, surrounded by water and hills whose roots are hidden in the depths of Loch Fyne where ancient history, legends, myths, and humor have grown out of the morning mist. Frank stopped outside Kilmartin in a spritz of rain to look at the standing stones. He and I walked in the mist and tried not to step on sheep droppings. Continuing north, we three travelers arrived at Easedale on the Isle of Seil, crossing the majestic stone Bridge Over The Atlantic. I had never thought about where the Atlantic ended, but it ended there in that part of Scotland. The view of the islands and grassy hills was so overwhelming I couldn’t take it all in. I wanted to put my arms around it all. I looked out to sea and thought about a lady standing in a bay holding up a torch in her hand. We ate a picnic and enjoyed the sunshine and view from the little park. It clouded over and was delightfully cool. If one doesn’t like the weather here, wait a few minutes and it changes. There is a little bit of every kind of weather each day and seems to rain or mist almost every night. 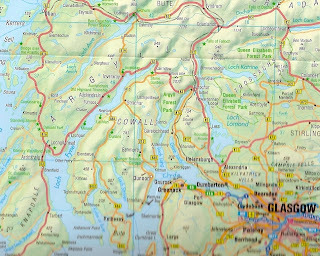 We were so near Oban, we drove up and stopped on the Corniche to let Murphy and Jack wade in the ocean. very good eating, but I missed my vegetables. Another day of adventures started at Largs down the coast from Paisley. The dogs had fun chasing sticks into the ocean and Cassie played her bagpipes. At Ayr, the birthplace of poet Robert Burns, we ate a bite and enjoyed the sky and clouds - an incomparable landscape. Back in Paisley, Frank took me to see the Wallace Memorial and his birthplace at Endersley. As I was taking pictures, an older lady walked across the street with a beautifully illustrated color pamphlet and asked if I had one. Since I didn’t, she gave it to me. When I told her I was from Las Vegas, she told me she had been there in 1983 and 1988 and commented about the size of America.